DVD Synopsis: Jon Voight, Burt Reynolds, Ned Beatty and Ronny Cox play "weekend warriors" who set off in two canoes down a mystery-laden Georgia river – and discover a wilderness of terror. Director John Boorman (Excalibur, Hope and Glory) sets them – and viewers – on the knife-edge of survival. Adapted by James Dickey from his novel and nominated for three Academy Awards including Best Picture, this "absolutely first-rate piece of moviemaking" (Charles Champlin, Los Angeles Times) draws us in with the irresistable force of a raging current. As the events of Deliverance unfold, it becomes painfully obvious that the four main characters are completely out of their element, not to mention utter fools for having taken this dangerous trip in the first place. Bobby (Ned Beatty), who’s an admitted novice when it comes to surviving in the wilderness, brings an air mattress to sleep on, and has difficulty navigating the canoe their first day out. Lewis (Burt Reynolds), the only one of the group who seems at home in the great outdoors, scoffs at Bobby, and worries that Bobby’s inexperience will be a burden on the rest of them. But then Lewis himself may be more hot air than anything. He talks a lot about becoming one with nature, yet when they first arrive he has a hard time just finding the river. Lewis does have some experience as an outdoorsman, but it’s probably not nearly as extensive as he’d like his friends to believe. When Ed (Jon Voight) tells the others that Lewis knows the woods, Drew (Ronny Cox) disagrees. “Lewis learned the woods”, Drew says, “but he doesn’t feel them. He wants to be one with nature, but he can’t hack it”. And all four will learn the hard way that these particular woods are no place for anyone who can’t “hack it”. 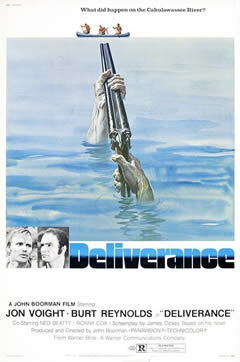 Deliverance is a brutal, savage film, a tale of foolishness set against an impressively scenic backdrop. Yes, the river is beautiful, but there’s an inherent duality in this particular corner of nature, and what’s beautiful one minute can turn deadly the next. Good review of a great movie, one of my favorites. There's a few interesting themes going on here (nature vs. progress, class warfare), but it's a well-made action film as well. Definitely read the book by James Dickey, who also wrote the screenplay, and appeared in the movie as the Sheriff. The sequence where Ed scales the rock wall is one of the most suspenseful I've ever read. @pav777: Thanks for the comment, and for stopping by! You're absolutely correct in that there's a lot going on in this movie, and it's handled wonderfully. I haven't read the book yet, but from what I'm hearing (from you and others), it's definitely worth checking out. Great movie! I'll take a little issue with you concerning Lewis. Sure, he's a city boy, but he TRIES to be an outdoorsman and succeeds pretty well, in my view. And he did come to Bobby's rescue in an heroic fashion. Then, when he gets knocked out of commission, his "followers" have to struggle in the wilderness by themselves without his help. Canoeing down a river seems like a weekend outing that could be fun, and I don't think the guys are fools for wanting to get away from their hum-drum lives for a little adventure. (Well, maybe Bobby shouldn't have gone). Hell, I would have done it.